PHILADELPHIA (Feb. 21, 2016) -- Brig. Gen. Carl A. Alex, assistant G-3/5/7 for U.S. Army Forces Command, was recognized Feb. 19 for exceptional service to the nation during the 11th Annual Stars and Stripes awards dinner here. "His momentous contributions to the military, to our country and to local communities have shaped the lives of countless individuals during his more than 30 years of military service," said Vice Chief of Staff of the Army Gen. Daniel B. Allyn. Army Brig. 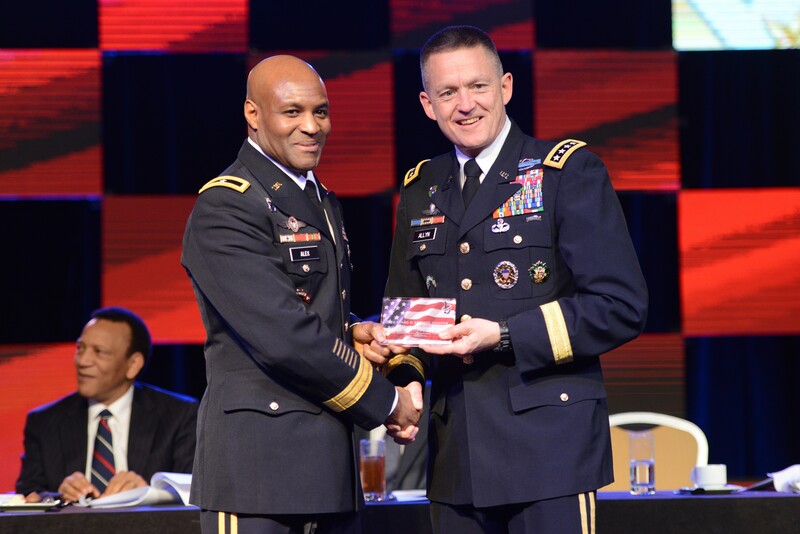 Gen. Carl A. Alex, assistant deputy chief of staff, G-3/5/7, U.S. Army Forces Command, left, was recognized during the 11th Annual Stars and Stripes honors, Feb. 19, 2016, during the 30th Annual Black Engineer of the Year Awards science, technology, engineering, and mathematics conference in Philadelphia, Pennsylvania. Vice Chief of Staff of the Army Gen. Daniel B. Allyn, presented the award. Allyn spoke during the dinner, Feb.19, in Philadelphia. The annual event recognizes top-performing African-American general and flag officers, senior executive service civilians and leadership within the U.S. armed forces, and is held concurrently with the Black Engineer of the Year Award, or BEYA, STEM conference, now in its 30th year. STEM is shorthand for science, technology, engineering, and mathematics. Allyn highlighted portions of Alex's career that most closely align with STEM, in particular, his involvement in logistics, where he provided Soldiers with the latest equipment with which to perform their mission. "[He] served with distinction as an airborne infantry brigade commander at Fort Bragg, North Carolina, and deputy commander of the 10th Mountain Division at Fort Drum, New York," Allyn said. "As deputy commander, he was responsible for supervising all aspects of logistics planning, fielding new equipment, and operations for over 18,000 Soldiers serving in Afghanistan and Iraq." Alex was but one of eight military award recipients at the dinner, which was this year hosted by the Navy. Vice Admiral Bill Moran, chief of Navy personnel, served as keynote speaker for the event, and explained why the recognition was so important. "We are here to lift those individuals up, to make them real to America," Moran said. "We applaud their service, their dedication and their humility. What better way for us to remember the legacy of this great city than to reflect on the American spirit that is still ignited and shining brightly in these individuals tonight."